All hardware, brackets, hoses, and online installation instructions. Side view showing the depth of our lower intake which allows for a huge volume of air. Notice the size of our custom oval single blade throttle body too! 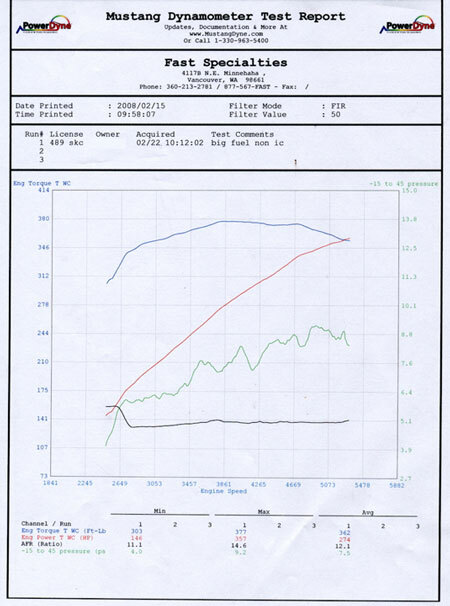 Rear wheel HP improved from 242 to 357 and Torque from 271 to 377 on a Mustang type dyno! Notice the 100 ft-lb improvement in torque as low as 2000 RPM that you don't see from a centrifugal kit.